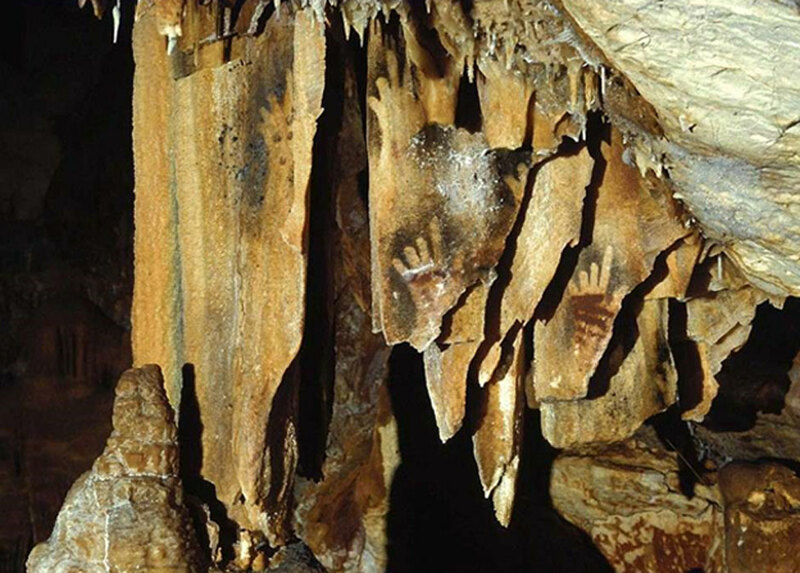 As an example of missing fingers in the art of people in warmer climates, the researchers point to the ‘Grotte de Gargas’ in France, in which “114 out of 231 hand images have missing fingers.” They also note that the painted hands on the cave walls at Grotte de Gargas “appear quite flat” which rules out the possibility “that some fingers were simply held back as the print was being made.” Fair enough. At this stage in their research, the researchers “looked at history books and found that 121 groups of people living on different continents have been found to engage in finger amputation rituals.” Discovering that finger amputation rituals took many forms, for example, in religious ceremonies and in punishment rituals, the researchers concluded that “there is no way yet to prove that such rituals occurred, or that intentional cutting of fingers was carried out by people of the Upper Paleolithic ,” but they believe they have amassed sufficient evidence to warrant further investigation. Finger amputation was undertaken both to “gratify and drive away the spirits, while also providing a way to use physical pain as an expression of sorrow and suffering.” The Dani tribe members held deeply superstitious beliefs about amputation and held that “if the deceased were a powerful person while living, their essence would remain in the village in lingering spiritual turmoil” according to the ScholarBlogs article. In the ancient past, for a person to ritually amputate a finger, he/she would first tie a string tightly around the upper half of the finger for about 30 minutes until it became numb, ready for a “nearly” painless removal. Then the finger would be placed on a flat rock and an axe head would be dropped as hard as possible - boom - job done. Then the person would cauterize the wound with a heated stone and either burn the severed finger to ashes, or find a fitting storage place that would enhance his/her home’s ritual environment. Creating Prehistoric Culture: Were the First Artists Women? Room for Doubt in the Scientists’ Claims? It is morally honest and a tight adherence to the scientific method that led the three researchers to “not” conclude that the missing fingers they found in the Upper Paleolithic cave art represented any kind of ritual amputation. Why? Because although not a single article you will read covering this story will tell you, what has been ‘overlooked’ here, is all of the ancient cultures out there which also depicted people with three and four fingers, that did not practice ritual amputation. Many of the cultures in Pre-Columbian Colombia, for example, the Muisca and the Tairona people, painted and carved 10s of thousands of depictions of three and four fingered people and never has a skeleton been dug up with ‘ritually’ amputated fingers. In bodies where fingers and limbs are missing, diseases and breakages are most often found in the bodies, indicating the removal of fingers was restricted for medical applications. Any comprehensive scientific paper in the future which might aim to prove that missing fingers in art meant ‘ritual amputation’ might want to consider all of the cultures that didn’t chop each other up, yet still illustrated folk with missing digits in petroglyphs and pictograms.